Natural born hunters, the English Setter is a canine built for being active. They are exceptional hunters and runners. They do require a fair amount of exercise during the week or they can become rather anxious inside the home. Overall, they are well behaved indoor dogs otherwise. Setters can easily fit into a crowd of people, they are calm toward visitors, other canines and play well with children as well. English Setter hounds are extremely fit dogs because of the high level of exercise they require and can withstand. On a daily schedule, it is recommended the Setters are free to run in an open space or at least walk their neighborhoods for a minimum of one hour per day. They are most at ease having the freedom to play in and outdoors. Given they possess a long coat of fur, they will need groomed at home two to three times per week. For the Setters with the bright white coats, it may become a challenge to keep their fur that bright for years to come as active as they are getting a dull coat is no surprise. The obvious nail trimming and dental cleaning will be required as needed. English Setters are such mobile creatures that they do run into an occasional common problem developing joint and bone ailments such as CHD, which is canine hip dysplasia. This can be monitored along with the guidance of your vet, but generally develops as the Setter is older in age and more common in ones that are larger in size. Hearing loss is also common, along with elbow dysplasia and hypothyroidism. A very seldom number of Setters have experienced issues with epilepsy. The thyroid issues can also be manageable when consulting with the vet, some with medication and more activity can diffuse the overactive thyroid glands in the canine. The average lifespan for an English Setter is ten to twelve years and common testing procedures for these hounds as they age are for their eyesight, hearing, thyroid and joint conditions that could become a potential problem later. Average weight ranges from 50-65 pounds for a male or a female Setter, and their height is generally at the two foot mark. The English Setter is one of the oldest breeds of canines dating back to the 1300’s in England. They were notable hunting dogs with the ability to find and capture their game and also stand in one position without any movement for quite some time as the resourceful hunters that they are. 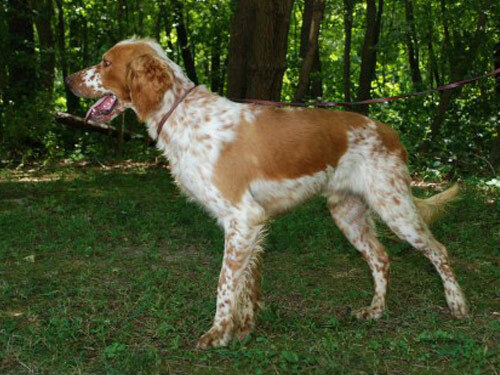 Experts believe the breed derived from the Spaniel family as well as possibly the Spanish Pointers. Breeder Edward Laverack took the English Setters and transformed their popularity from 1825 and lasted for some 35 years after. Mr. Laverack was a hunter from a town called Belton, where the Setters are still a notable breed of gundog to this day. Shortly after Edward’s success breeding the Setters, another was soon to follow suit by the name of Purcell Llewellin, who began his breeding group from a few of Edward’s Setters and went on to create a family of incredible field dogs. Purcell’s became well known for their outstanding hunting and running abilities, while Edward’s were exceptional show dogs. They have crossed over to be a very popular breed in the United States currently.